My new book & video breaks down the concept of “Tactical Periodization In Soccer”. Tactical Periodization is a method of coaching soccer made famous by coaches like Jose Mourinho and Andre Villas Boas. When studying “Tactical Periodization” it reminded me of “chemistry class” in college, which I never fully understood. Tactical Periodization has a lot of terminology that tends to be a bit confusing, redundant and somewhat like a puzzle. That being said, I found Tactical Periodization to be one of the best ways of training and teaching the game I have ever seen. Tactical Periodization is a way of organizing the entire seasons training into weekly cycles called “Standard Morphocycles”. Every Morphocycle teaches the “Game Model”, which is set by the coach. The “Game Model” is the way the coach wants the team to play (style of play & identity). Tactical Periodization in short is: Model of Play = Model of Training. Every single practice directly relates to teaching the Game Model. 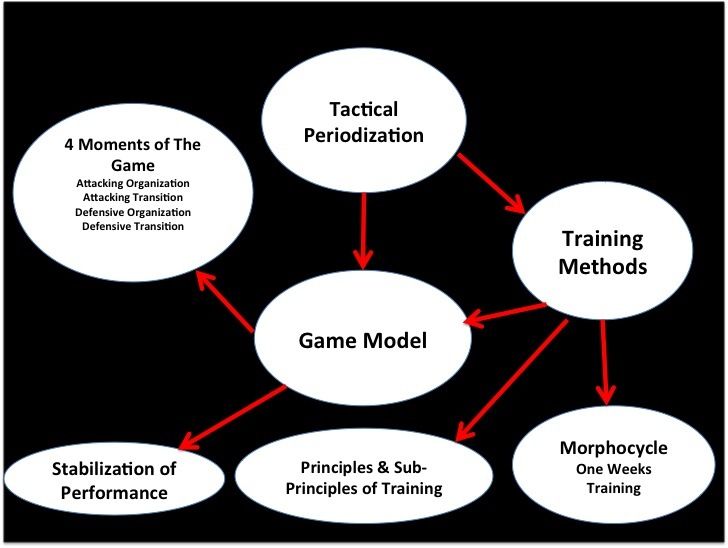 Tactical Periodization” can be used by any team or coach, regardless of style of play or desired game model. The game model of Barcelona will look vastly different then the game model of Real Madrid. Because the game models are different, the training will be different as well. However, both Real Madrid and Barcelona can use “Tactical Periodization” successfully, even though they have different ways of playing the game and different ideas about the game. I recommend every coach study Tactical Periodization in detail. Plain and simple, it will make you a better coach. By studying the concepts of tactical periodization, you will be able teach the game the way you believe it should be played, but in a very organized and almost scientific way. My video and book explain tactical periodization in detail, covering everything you will need to know in order to implement it successfully with your team. I also offer my own personal suggestions in regards to modifying tactical periodization, so it can be used successfully in any coaching situation. Once you spend the time to fully comprehend tactical periodization you will never look at coaching soccer in the same way. Look for my book and video on Tactical Periodization in Soccer coming out this January.